Here’s the last of my Momoto columns which was published in January 2013. A Japanese translation is below. The term ‘Okinawan music’ doesn’t just refer to music from the main island of Okinawa. It also includes the wide variety of songs and music from many outer islands spread throughout the Ryukyu chain. A very large number of these musical activities originate from the Yaeyama Islands and it’s here where the traditional music is still most vital and alive. Since my first visit to Ishigaki I have been to most of the Yaeyama islands and earlier this year I met the ethnomusicologist Matt Gillan. He has just published an academic book on his research in Yaeyama which he chose to study because of the unusually rich musical culture on the islands. During his time there he discovered music thriving in many rituals and in lineage and preservation groups, as well as in the annual ‘Tubarama’ song contest, and, of course, through the many well-known professional singers. 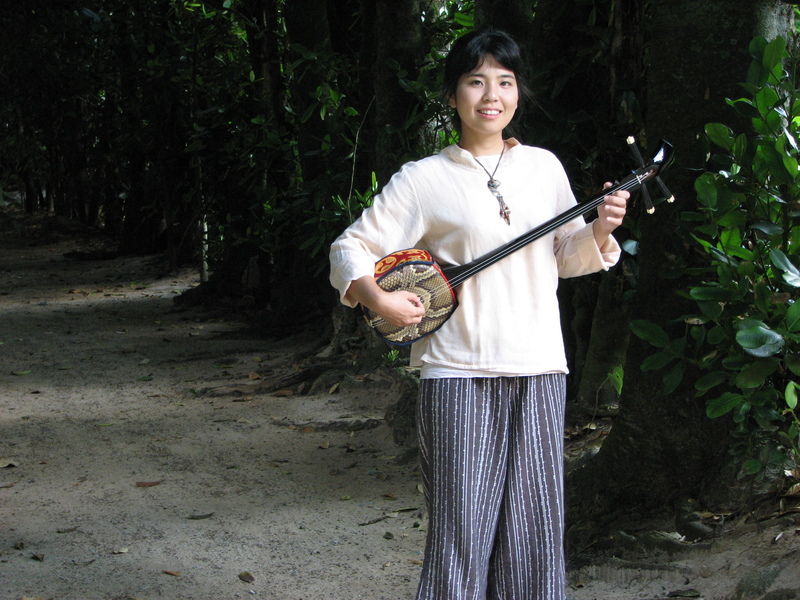 Musicians from Yaeyama continue to hold a special place in their islands’ culture and a disproportionate number were active in the Okinawan music boom in mainland Japan which began in the 1990s. At that time I met one of the most important performers, Oshima Yasukatsu. We subsequently got to know each other and he asked me to take on the task of co-translating into English some of the songs and sleeve notes for his albums. Through my contact with Oshima I went on to meet many other musicians from Yaeyama. One of these was Hatoma Kanako who I first interviewed when she was just 18 after the release of her debut album in 2001. Since then, I’ve visited the live music venue run by her parents on every trip I’ve made to Ishigaki and look forward to the warm welcome I always receive there. This year Kanako has performed in concert with Oshima Yasukatsu and she also sings on his latest album. These are just two of the many fine musicians I’ve met, both amateur and professional, who continue to emerge from these islands of song. Here is the text of my third column for Momoto magazine, published in October 2012. A Japanese translation is below. In Japan all conversations turn sooner or later to food and Okinawa is no exception. This is quite different from my own country where only a gourmet is likely to dwell on the subject of eating for very long – understandably, some might say, given the lowly reputation of British cuisine in the past. But I soon discovered musicians in Okinawa who are happy to sing of the delights of eating on these islands. One of many shimauta to catch my attention was the song ‘Goya Bushi’ which was recorded by Yokota Yoko. The song is about the virtues of this iconic island vegetable. 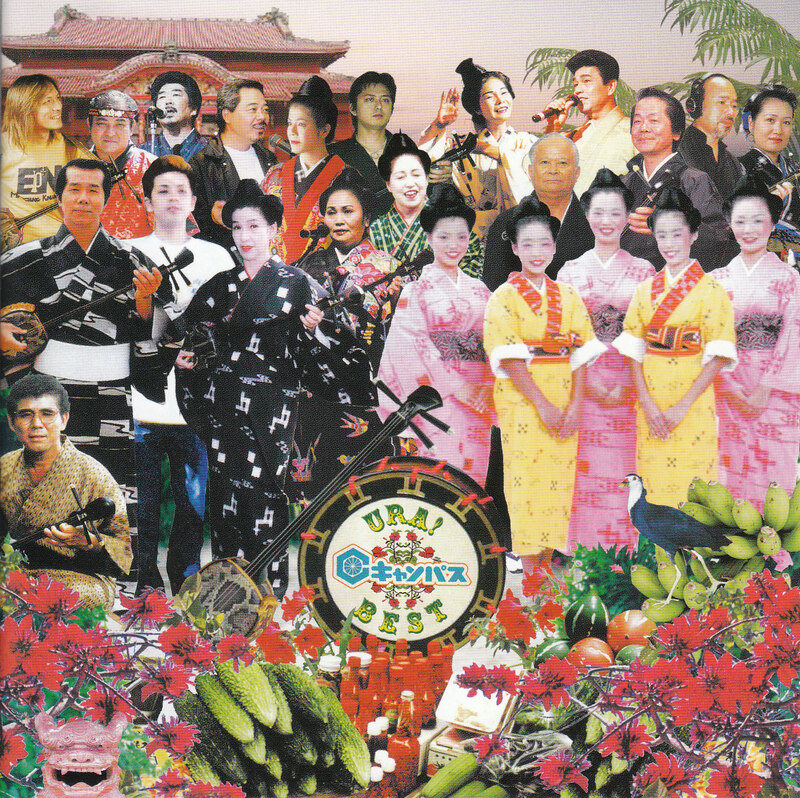 Yokota’s version is hardly subtle but it’s the typical shimauta arrangement heard in music bars all over these islands. The words tell of the many reasons why goya is good for you and there is even a verse mentioning the importance of Vitamin C in hot weather. The song is included on the second of two compilation albums released in 2005 to celebrate the 35th anniversary of Okinawa’s Campus Records. Both CDs have covers parodying The Beatles’ Sergeant Pepper album and pictures of the ubiquitous goya are also prominently displayed. ‘Goya Bushi’ is also included on another compilation released the following year by Respect Records to commemorate another great institution – Okinawa soba. This album celebrates the popularity of the island speciality in all its many forms. And it’s not just soba and goya – providing some variety on the album’s menu are the songs ‘Mango nu Uta’, and ‘Awamori Monogatari’. The relative wealth of the Ryukyus today was not always the case and the hardships of the past cannot be forgotten. In the Amami islands the song ‘Honen Bushi’ arose as a result of the Satsuma invasion. The people of Amami suffered extreme poverty and sometimes starvation after sugar cane production was introduced and all the profits were taken from them. The song expresses despair about this situation and asks for a good harvest. Not all songs about food are happy. Below is the main text of my second column for Momoto magazine which was published in July 2012. A Japanese translation follows the English. Why am I living in Okinawa? I have one man to blame for this – his name is Kina Shoukichi. 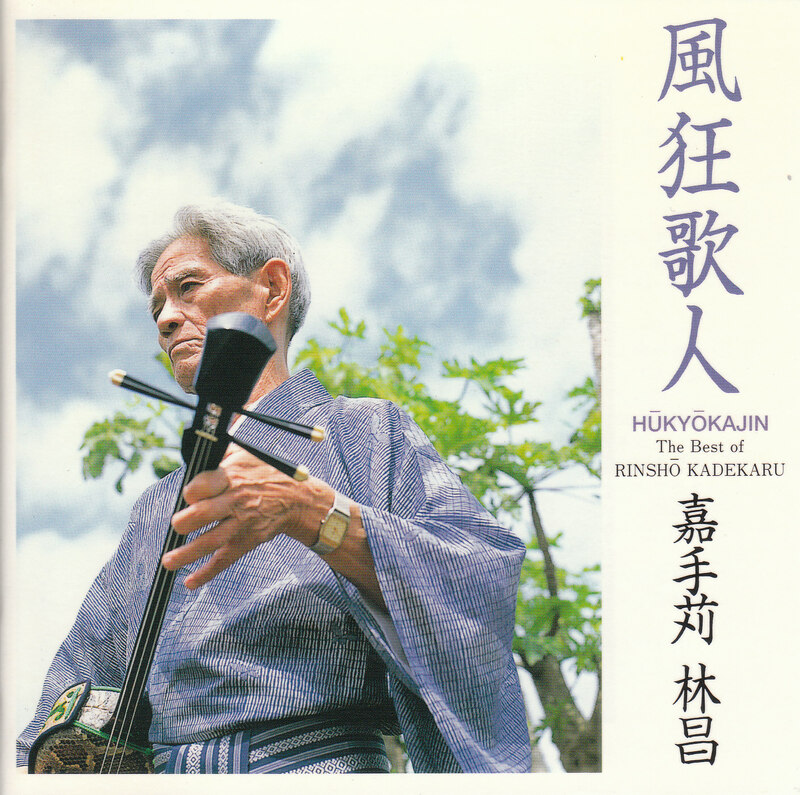 When I listened to him it came as a great shock to hear Okinawan music for the first time. Japanese music was very lacklustre and unexciting by comparison. My discovery led me to many other kinds of Okinawan music and finally to moving here. I first met Kina at the end of the 1980s when he and his band Champloose put on such a life-affirming show in Kyoto that I still remember it as one of the highlights of my life. I then interviewed him for a magazine and in 1994 met up with him and his band in England when they performed in London. The next day I drove him to my hometown of Norwich where he did a live interview on local radio. While most people know Kina for his song ‘Hana’ I would be perfectly happy never to hear this over-recorded song ever again. For me, there are two different songs which are far more moving. One is ‘Agarizachi’, a Kina original which refers to a point on the coast of Yonaguni and expresses love and concern for these precious islands. The other song that I like even more is ‘Nagareru Mamani’ which blends Kina’s words with a beautiful melody by Fukuhara Tsuneo. Kina is also surprisingly good when performing Okinawan minyo and it’s easy to overlook that he is also a great singer. Kina Shoukichi can also be exasperating and eccentric. His political activities sometimes seem to be at odds with the views expressed in his music. And despite telling me many times that he is eager to write more songs, he has produced little recently to match the glory days of his past. But as the man who introduced me to Okinawa and changed my life forever he will always have a special place in my heart. 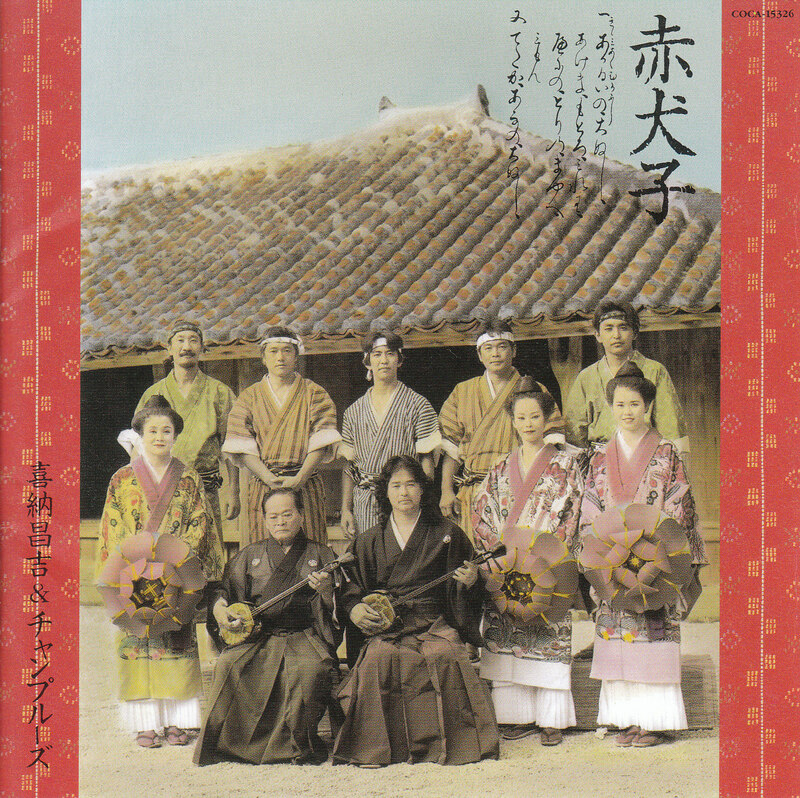 Akainko was a wonderful album of mainly traditional songs made in 1998. Kina shows that he has a remarkable voice and a great feeling for these old songs. Momoto is a quarterly magazine published in Japanese in Okinawa and it focuses on life and culture on these islands. Last year I was asked to write a column Sounds of the Ryukyus for Vols.10~13. The column I wrote offers some very simple, brief introductions to Okinawan music topics from a personal perspective. The main text of the first column is reproduced below in English followed by a Japanese translation, and subsequent articles will be added to this blog. The magazines containing the complete columns with illustrations and photos are still available in most bookstores in Okinawa. I’m very happy to be writing this first column and hope to introduce some of my favourite music from these islands. My discovery of Ryukyu Island music began many years ago in the late 1980s. After listening to all kinds of Okinawan music, and travelling around the islands many times, I finally decided to move here. I soon realised that minyo is at the heart of the people’s music and that Kadekaru Rinsho is its finest representative. It’s well-known that Kadekaru recorded hundreds of songs and continued to sing and record until shortly before his death in 1999. But he is about as far removed from the usual image of the stage performer as it’s possible to be. He was a rather shy and reticent figure despite his many achievements and his voice sounds thin and wavering, but the more I listened to him the more addictive it became. He also had an enormous repertoire not just from Okinawa but from Miyako and Yaeyama and listening to him became an excellent way for me to find out about these wonderful songs. I was lucky enough to see him perform twice at the 1997 and 1998 Ryukyu Festivals in Osaka. Since his death the following year there have been many albums released on CD but I always return to his ‘Jiru’ compilation of rare recordings and to his joint album ‘Uta Awase’ made with Yamazato Yukichi. It’s very difficult to pick favourite songs but his versions of ‘Nakuni’ and the lively ‘Umi Nu Chinbora’ are great tonics. Most of all, I enjoy listening to his song ‘Jidai No Nagare’. This moving song describes the fate of Okinawa as it has been taken over and changed by various outside forces – from control by China to invasions by Japan and America. It seems to me the quintessential song of Okinawa. The quarterly magazine Momoto is published in Japanese in Okinawa and focuses on life and culture on these islands. For issue number 6, which has just been published, I was asked to write a feature on Okinawan music. The article – ‘The Soul of Okinawan Music’ – is published both in English and in a Japanese translation. It’s also available to read now on the Features page of The Power of Okinawa website. The Japanese translation can be found by clicking on the link below the title. The article includes some quotes from interviews with musicians Tetsuhiro Daiku, Bob Brozman and Tatsumi Chibana. The complete versions of these interviews are in The Power of Okinawa book.